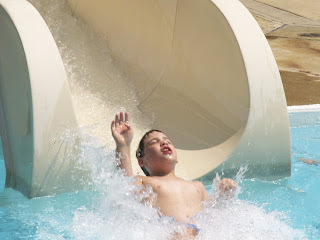 Jax can climb the 37 steps up to the Super Slide at the public pool, slide down the slide, and splash triumphantly in the deep end of the pool. Jax has hemiparesis, a weakness on one side of his body. Climbing steps or stairs can be a major challenge for someone with hemiparesis. Just imagine needing to balance and shift your weight, without having total awareness and control of one side of your body. This is an amazing accomplishment for Jax! Rachelle competed on the PBA Tennis Team in 2007 and has been a member of the US Paralympic team, twice in Track & Field and once in Table Tennis. She competed in track at IPC World Athletics championship Lille France in 2002 and in Assen Netherlands in 2006, and won a Bronze medal in the 100m sprint at the Parapan American Games in Rio Brazil in 2007. She has won numerous gold, silver, and bronze at US Paraplymic National competitions in track and field and also competed on her high school track and field team. Rachelle is currently a sophomore at Palm Beach Atlantic University (PBA) majoring in Physical Education and Exercise Science. During the fall 2008 semester, she taught tennis to underprivileged children at a local community tennis facility. She is currently working as an assistant tennis pro at a nearby country club and will be competing in USTA amateur tennis tournments. Upon graduation, she hopes to work in parks and recreation and become a certified tennis professional. 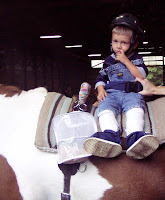 Rachelle was diagonsed with left hemiplegia at age 4 months with high spasticity. She was diagnosed with seizure disorder at age 4 and took medication until age 16. She had two surgeries in her left heel cord, one at age 3 and a second at age 10. She wore an AFO until age 10. She has a 20% vision fielld cut and had problems with migraines triggered by eye strain. On-going participation in a variety of sports and physical training are the key factors in overcoming her multiple disabilities. When Collin was 12 months old, I noticed that he wasn't pulling himself up or attempting to take steps and that he appeared to be left hand dominant. His pediatrician referred us to a neurologist and Collin was diagnosed with having had a stroke in utero (while I was pregnant with him). Initially, we were devastated. We never imagined that he could have had a stroke. Collin just turned 3 and he is just like every other 3 year old! He is very independent and wants to do everything for himself. He walked at 17 months and is now climbing and crawling through everything. Collin makes friends everywhere he goes and he has a very happy personality most of the time (expect when he hears the word "no"!). He is a very loving, charming, little boy, with his own special personality. The perinatal stroke diagnosis was a hard diagnosis to come to terms with, but Collin continues to progress daily and we know that he will be as successful, if not more so, than his peers! 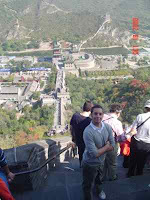 Medhat and his family recently visited the Great Wall of China. This is a very steep climb and Medhat climbed all the way, taking those steps three at a time! He did lots of walking during the week long vacation. Medhat is not letting his hemiplegia stop him from enjoying life.